The food truck scene in Philadelphia is growing crazier and crazier, and I love it. We have mac ‘n cheese trucks, pizza trucks, cupcake trucks — but somehow, I never expected to see a donut truck. 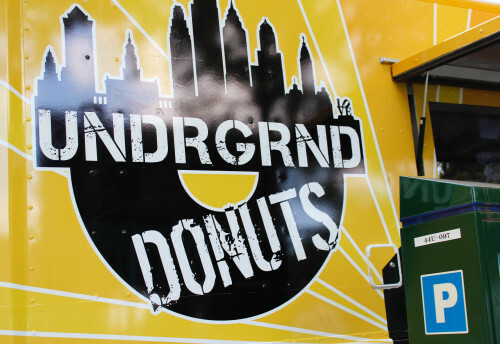 However, the newest addition to the Philly mobile landscape is precisely that: Underground Donuts, which opened its truck window just a few days ago on September 18. 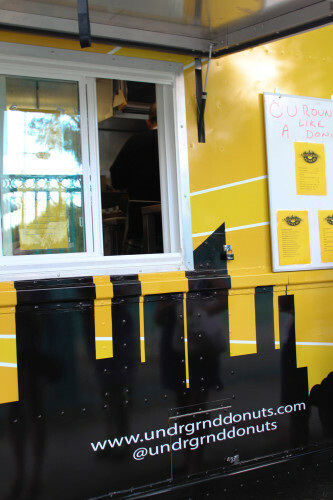 An inviting bright yellow truck with a clever logo, Underground Donuts travels around but can usually be found at 33rd and Arch (check the schedule at their website, http://www.undrgrnddonuts.com/). A quick walk from Penn, especially if you’re already around the east side of campus, I went with a few friends on a sunny afternoon to try these donuts. 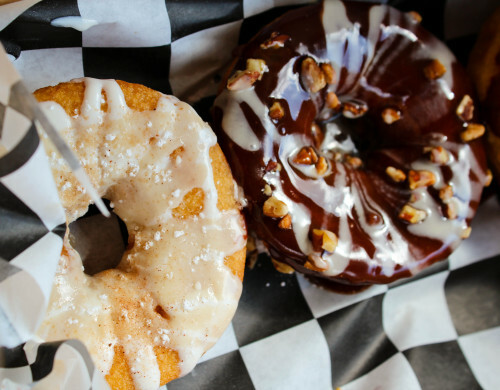 From scoping out the menu online, I already had several options in mind for donuts I wanted to try. However, upon reaching the truck, I saw they also had a make-your-own option — which I thought was pretty awesome. At how many places can you have a customized donut that is the product of your own creativity? A single donut (of the “daily dozen” flavors that they have listed) is $1.95, a make-your-own donut slightly more. 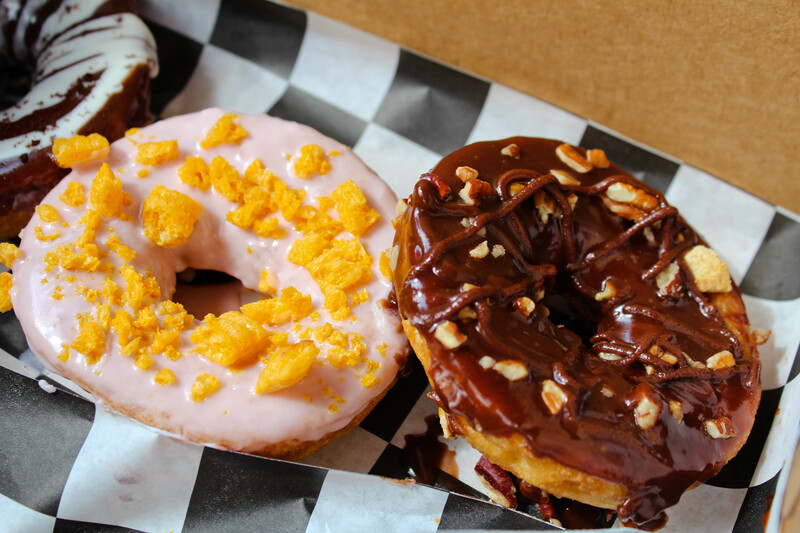 We decided to split a six-pack of donuts, for $9.95, selecting flavors such as the “Captain Kranky” (strawberry glaze and Cap’n Crunch bits), “Euro Smash” (chocolate glaze, chopped nuts, and nutella swirl) and “Wake Me Up” (chocolate glaze, cream swirl, and a dusting of espresso). Our last choice was the intriguing “420,” which is basically the mystery bag — they give you whatever, but they were good about asking us if there was anything we couldn’t eat (e.g., nuts, bacon). The wait was slightly long, but I didn’t mind because Rival Bros. was parked right next to Underground and I got an iced coffee ($3.00). Coffee and donuts — what could be better? Underground does offer coffee, tea, and hot chocolate, but on a warm sunny day, it had to be iced coffee. Finally, we got our box of donuts. The donuts aren’t like your stereotypical Dunkin’ or Krispy Kreme donuts — Underground’s are a little flatter. Another difference was that Underground’s donuts were denser, with more of a “cake” texture, similar to the donuts from Federal Donuts. This donut base served as a perfect backdrop for the varieties on glazes and toppings. Be warned: Underground doesn’t skimp on the glaze. 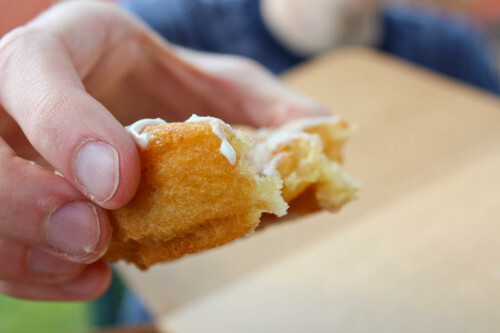 Your hands WILL become a sticky mess (I guess you could use a fork and knife, but donuts aren’t meant to be that highbrow), so I’d advise bringing or getting napkins to attempt to remedy the mess a bit. The first donut I tried was the “Captain Kranky.” The pink glaze looked inviting, but overall I found it pretty bland. It wasn’t a bad donut, but I wanted a punchier strawberry flavor in the glaze that would really contrast with the slight vanilla of the donut. 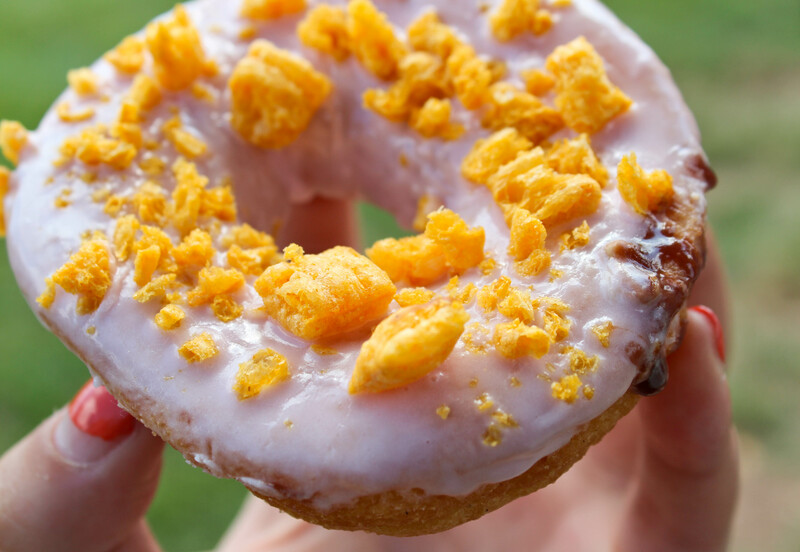 The Cap’n Crunch topping served as an interesting texture contrast to the soft donut base, though. 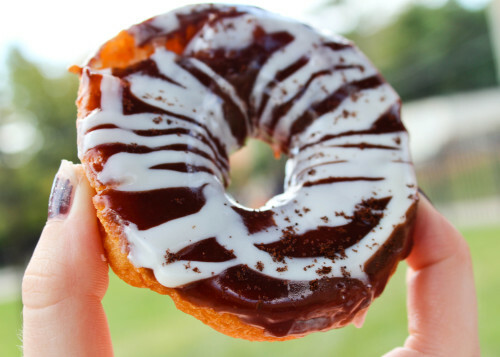 The French Toast donut (drizzled with maple syrup, cinnamon, and powdered sugar) was simple and perfect the way it was. The cinnamon amplified the sweet donut base, and it tasted just like good French toast. I’d get this again. 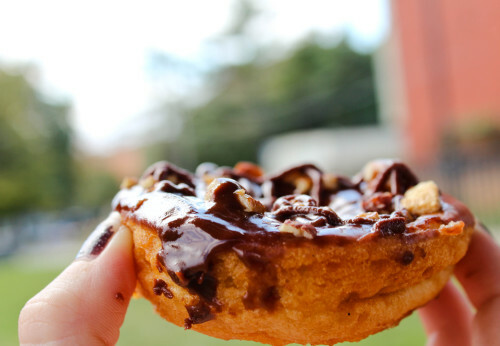 My favorite donut was probably the “Euro Smash,” although my Nutella bias may play a strong role in that decision. 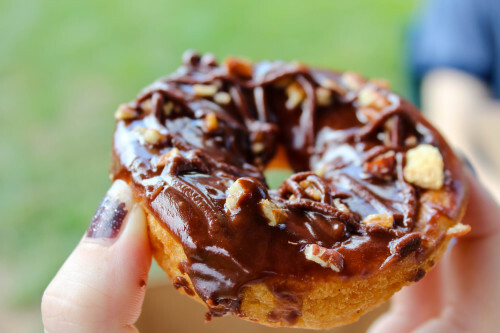 It was a perfect combination of velvety chocolate glaze, a smattering of chopped nuts, and just enough Nutella swirl on top to enhance the chocolate flavor and not overpower it. 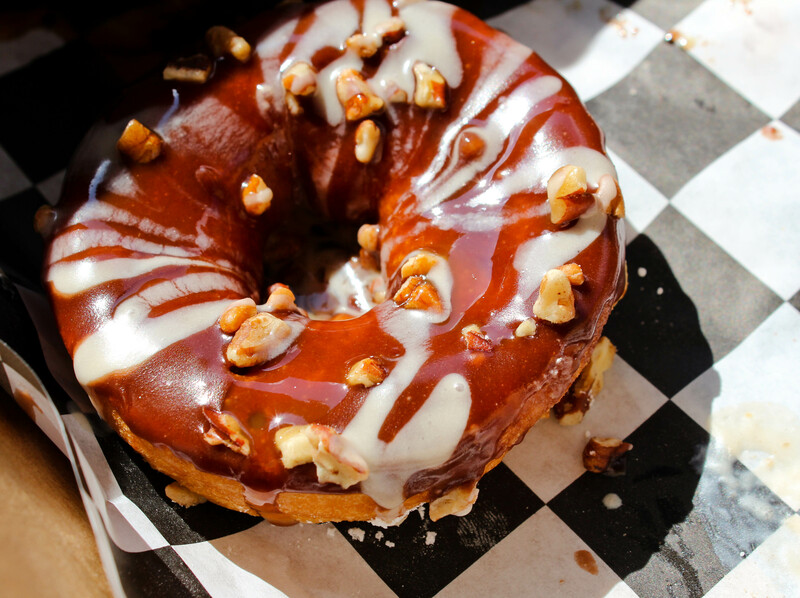 Our mystery flavor for the “420” was a donut topped with a bacon-infused maple glaze. The bacon’s smoky flavor was a little jarring at first combined with the sweetness of the donut and the glaze, but after some acclimation, was actually a really interesting combination. Ultimately, go with friends so you can get a variety of donuts and sample a bit from all of them. 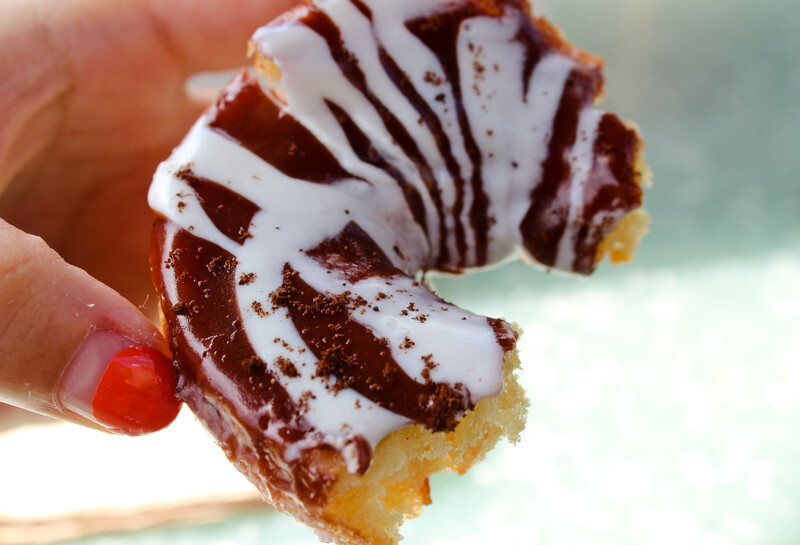 As for me, I’m already planning my next trip as there are more flavors I want to try, such as the “Black Forest” (raspberry glaze, shredded coconut, and chocolate chips). Affordable, fresh-made donuts just a few blocks away from campus? Donut craving or not: treat yo’self.